As Americans, we show our patriotism through the singing of the national anthem of the United States called the Star Spangled Banner. As North Carolinians we also want to show our state pride in the state song named The Old North State. However, most Mitchell County residents probably don’t realize that there is a Mitchell County song entitled Mitchell County for Me. 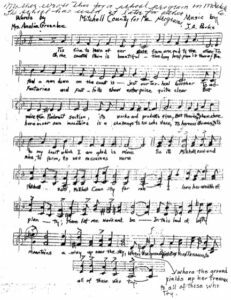 This song was written many years ago by Amelia Meares Greenlee. 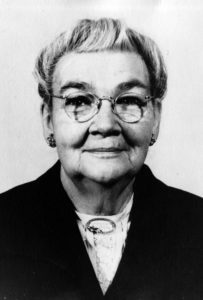 Mrs. Greenlee was a native of Clarkton, North Carolina, but moved to Spruce Pine in 1913 to teach at the new mission school at Grassy Creek Presbyterian Church. She married Sam Greenlee, son of one of the community’s earliest settlers. She began working for Mitchell County Schools, and was the first Mitchell County teacher to receive state retirement benefits on her retirement in 1947. According to an article in the Tri-County News in April of 1958, “For 25 years children in the community (at Harris Elementary) had the great privilege of going through her grade and not one ever forgot her radiant personality and encouraging smile.” Her teaching legacy lived on through two of her daughters who taught in Mitchell County for decades – Mrs. Elizabeth Greenlee Davenport and Mrs. Elvira Greenlee Bryant, as well as their children. Although Mrs. Greenlee wasn’t a native- born resident, her love for Mitchell County was boundless as shown in the words of the song she penned about our county. The copy shown here was given to this writer by her daughter, Mrs. Elizabeth Davenport, my fourth grade teacher. The notes in the margin are in her original handwriting. The song was put to music by J.A. Parks. To feel a man down on the coast is just our Tar Heel brother. But there’s a place close to my heart which I am glad is mine. So it’s Mitchell now, and Mitchell now, Mitchell County for me. Where the ground yields up her treasure to all of those who try. Oh the coastal plain is beautiful – the longleaf pine is there. The factories and foothills show enterprize quite clear. To harness streams, to mine, to farm, to use resources rare.